Instant prints from your phone or online storage. Simply plug your phone into one of our kiosks. or send us the order online. Orders online are charged in store when you collect them. Are your photos actually on your phone? 1. Photos may appear to be on your phone but are actually stored on the cloud. If this is the case plugging in may not work and our app. may be required. 2. Are your photos stored in your camera roll? If they are not then they will not be seen when you plug in. Again the app. can resolve this. 3. Are your photos stored in emails? If so you may be able to send them to your camera roll. Avoid screen shotting them as this reduces the quality considerably. 4. Are your photos in Drop Box? 5. Are your photos stored in Google Photos? If so you can log onto your Google Photos directly on our kiosk and print from there. Just make sure you have your login details to hand. 6. Are your photos on instagram? If so you can log onto Instagram directly on our kiosk and print from there. Just make sure you have your login details to hand. 7. Are your photos on Facebook? 8. Can you find your photos? When you plug your phone in most iPhones will only show what is in your camera roll. But they will show on our kiosk filed by photo name. That does not mean that the most recent are at one end of the list or the other. Some Android devices let you see folders, so you can pop your favourites into one folder. Listing images as favourites or ranking them will not be visable to the kiosks. 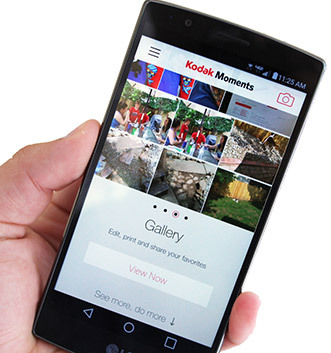 However the Kodak Moments App. will make finding photos so much easier. Or you may wish to email them to us. Always try and use the original image as it was taken. Whats App, Texting, screen shotting, Instagraming and Facebooking photos all can reduce the quality of your images. This reduces the ability for them to be printed in larger sizes. Even emailing needs to be used with caution. Emailing at low or even high resolution causes pixel loss, always use original size. For a full range of prices and products please look at the following pages.